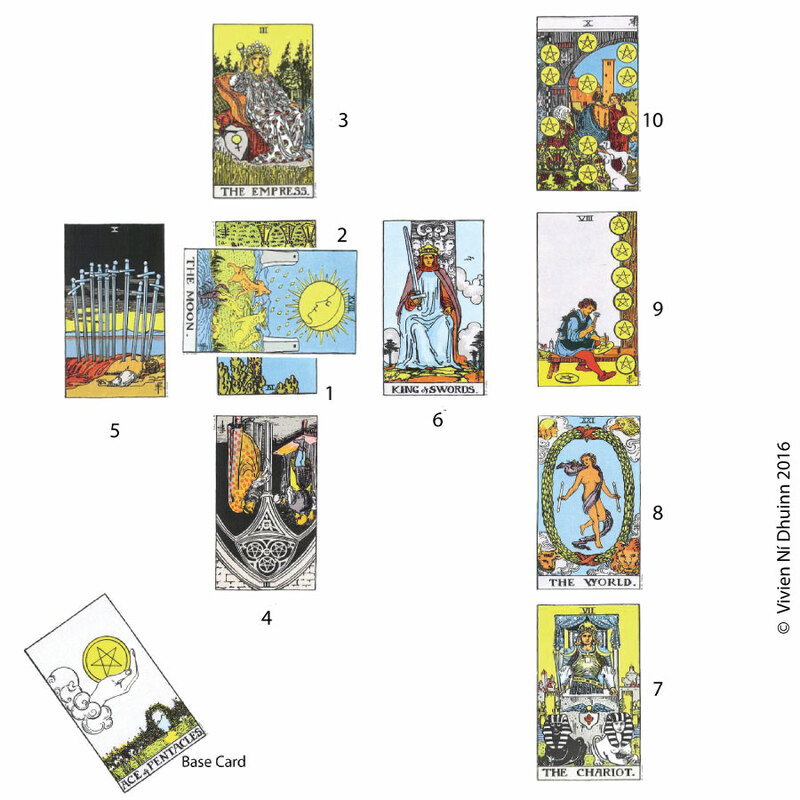 Here is an example of a Reading using The Celtic Cross Tarot Spread. Have a read through it and see if you can follow my train of thought when interpreting; where I found the connections and correspondences, how the story came about. After the Reading below, I have supplied a Step-By-Step detailed account of how I pulled it all together so that you can see for yourself exactly how I did it. Oh, just so that we are all clear, my client gave permission for her Reading to be published. I have changed my client’s name to protect her privacy. As per my method, I use a Base Card in all my Readings. This is optional. Card 3 – What Lies Above/The Conscious – The Empress (Aspirations and Conscious Desires. Desired/Ideal Outcome. The Higher Self). Cora came to me in September of 2015 for a Tarot Reading. She told me she had come to a point in her life where she really hadn’t a clue what to do and felt she had painted herself into a corner. She claimed to be tired and worn out by the demands of a life that seemed to be getting her few results. So I asked her to fill me in on her situation so that we had something to work with in her reading. Cora told me she was a singing teacher, had been one for over 20 years but had been forced to take a break from her career after been diagnosed with leukemia. During her months of treatment and convalescence she struggled hard to regain her previous state of health. She returned to work but was unable to keep up with the demanding workload. She was off more times than she was in work and eventually had to leave her job because her students were suffering from her erratic attendance. She fell into quite a deep depression and was living on her life savings to pay the bills. Her daughter came to her one day needing to access some personal belongings she had in the attic. Cora climbed into the attic to help with the search. She opened box after box and uncovered stuff she hadn’t seen in decades. She came across an old metal box file and was surprised to find sheets and sheets of music which she had composed when she was only starting out on her career path. She pulled the box to the side and told her daughter she wanted to take it down to have a better look at it later. That night she sat at the kitchen table and flicked through the reams and reams of music sheets and felt her heart begin to beat rapidly. She explained that she had written the music herself in her early twenties with a view to composing a full musical. In fact she had worked on several musicals at that time but completed none of them. She told me she had always wanted to be a singer songwriter, and that her dream was to see her work performed on stage. She said she never got to realise the dream as work, marriage and children took over. Her marriage ended in divorce leaving her with a young daughter and son to raise on her own. She never showed her work to anyone and so it had been put away in the attic and forgotten about. However, since the day she found her old music sheets, she began revisiting the work and felt her depression lift as she played and sang on the piano. Without realising what she was doing, she began adding extra notes and words. She wanted to finish at least one of the musicals but realised it needed to be adapted to a more modern audience. With her savings dwindling she began entertaining notions of actually selling her work after her daughter suggested she put it online. She ran with this idea for a while but got cold feet and panicked. What she really needed was a job so she shoved the music back into the box it had come out of and began applying for every position she could find. Cora had been out of work for a few years at this stage, and even though she had great qualifications, she just couldn’t get an interview. She was competing against all the fresh-faced, energetic and recently graduated job-seekers. She felt hopelessly inadequate and dated. She knew she could only work part-time due to her health, but now she also believed her lengthy absence from the workforce, coupled with health issues, would be a deterrent to any prospective employer. She decided to re-train in clerical administration and did several courses that were guaranteed to lead to employment, but even though she passed all her exams and added her new qualifications to her CV, it got her no closer to the interview stage. She felt worn out and at a dead-end. She hadn’t touched her song writing in months and was tired of her daughter asking about its progress. She felt she had been running around in circles and getting nowhere. She didn’t know how to move forward and was stuck. She would go back to writing music if she could be sure to make a living from it. This is what she really wanted to do but felt that she could not afford the luxury of such an indulgence. She believed she had missed the boat and was too old to start over again. However, the thoughts of finding a job that offered no emotional rewards at her stage of life left her very low. Cora desperately wanted to share the vision her daughter had of her work and what she could do with it, but she was terrified of failure. She felt a failure on many levels. Was she tool old to revive a dream? Would her music writing make the grade? Would anyone be interested in the musicals she wrote? Would anyone be bothered to pay for her work? Time was running out and she really needed to act on something once and for all. Cora was hoping for some guidance from the Tarot, so she concentrated on these queries and shuffled the cards on that basis. Here we see both the original birth and re-birth of a wonderful and possibly lucrative opportunity Cora has rediscovered. After hearing her story it also highlights the fact that it has remained in the realm of potential instead of manifestation. Cora’s unfinished work sits on pause and cannot move forward without effort on her part. It waits for her to act and this Ace of the Pentacles Suit is telling her she can make things happen if she really wants. This is a fresh start with a re-working of old energy to create worth in the present. As her heart lies in her music and not in clerical job offers, this card augurs well for running with her own project and business idea. There is a new dawn on the material plane which should be of benefit to Cora if she wants to take advantage of it. There could also be a job offer on the horizon which although not what she ideally wants, this card brings money with it. 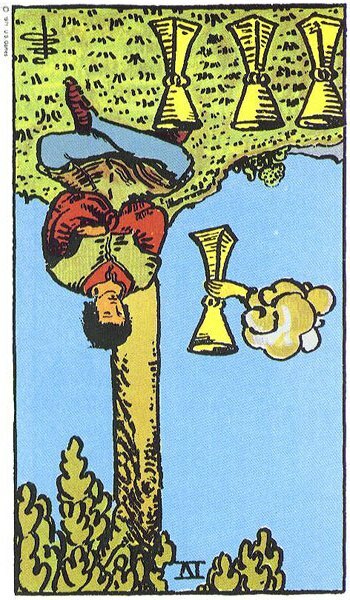 Card 1, The Present/Issue – The Reversed Four of Cups. For me this is the crux of the whole issue, and because of the nature of this card, I am going to rule out the endless job hunt she has been pursuing. I think she has been barking up the wrong tree. This is a card for pulling out of depression, for finding a renewed interest in life once more, but very much on the emotional plane. What is it that woke Cora out of her apathy and lethargy? It certainly wasn’t a job offer, or chasing after yet another interview. It was finding her sheet music, her work, her creation. I don’t think it had anything to do with re-training for the workforce. 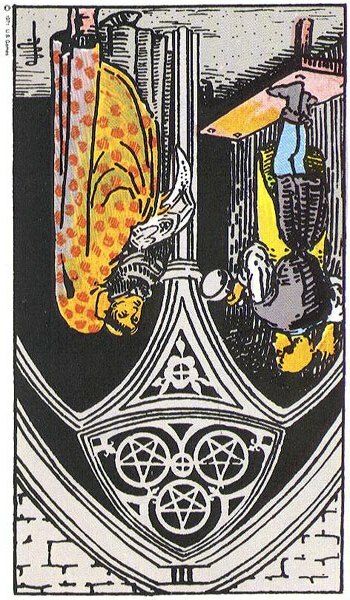 That would simply be a way to pay the bills, but with the Reversed Four of Cups influencing energy we are looking at something far deeper. The Cups are connected to creative and artistic talents, and this is what motivates Cora at the end of the day. She had been a singing teacher for years and loved her job. However, I believe she fell into a rut of some sort with her career and would still be doing what she was doing had it not been for the arrival of cancer. Would she ever have found the box of her uncompleted work if it hadn’t happened. Cora is being given another chance here. I am curious about something and want to ask her some probing questions, but I think I may already have the answers. Cora is not listening to her inner guidance, is not following her heart. The Reversed Moon suggsts to me that fear surrounds and controls the Issue. She operates form a position of fear and anxiety. She is also too tightly boxed in to distinguish the wood from the trees. She cannot think straight because troubling emotions cloud her view. Fear of the known and unknown unsettle her. She is running from the Reversed Four of Cups where the potential lies. She is trying to be too practical. She is dismissing her natural urges and to me this is something she has learned to do. She is not being true to herself. Cora is being held back from realising her potential and achieving her goals. Although she has re-ignited her interest in writing music again, underlying fears get in the way. Cora I believe has some old demons that cause trouble in this area. What is it that worries her so other than needing to earn some money? This I feel is a whole separate concern to paying the bills and runs much deeper. There is something in her past that rears its ugly head when she begins to feel passionate about herself or her work. I can see from the card below in Position 4, The Reversed Three of Pentacles, that Cora doesn’t believe she is good enough, talented enough, or has learned enough to earn success. I think she might be her own worst critic. She has grave doubts about her abilities. I will ask her about this when I get to that card. In position 3 she is crowned with The Empress. Now this is where the heart of Cora truly lies. This is her goal, her dream and what she aspires to in life. The Empress governs her creative and feminine side, and is who reached out to her in the Four of Cups to pull her out of apathy. The Empress is here to remind her of the seeds she planted so many years ago that now have to be brought to harvest. She has held on to her project for too long and it is time to bring it into being. Cora needs to work in the creative realm. It is where she will thrive. The Empress in her deeply desires the re-connection with her early ambitions. The Empress was with her when she was inspired to write her first piece of music, and she facilitated her recent efforts. However, The Empress will demand more of her. She wants Cora to birth her creation now and this means getting stuck in to completing her work. It has been incubating for a long time and progress must be made. The Empress also wants Cora to loosen up a little and to relax more. She cannot be at her best creatively if she is tense and worried all the time. She would also ask Cora to utilise her life experiences by bringing them into her creative work. Tell her own story through her music. She also would be encouraging Cora to re-connect with her femininity and to pamper herself a little more. She needs to channel the energy of The Empress and emulate her personality. Cora needs to become more vibrant and dynamic so that she can really get behind her work. This may entail shedding the music teacher look in order to replace it with on a far more flamboyant style. Here we see the under achiever, the half-hearted student, the under qualified. This is what Cora believes herself to be and is what blocks her assertiveness and progress to the material plane. It is where her Reversed Moon is nurtured. Cora doesn’t believe her work is good enough, that she is not qualified enough and that she will fail to impress. She doesn’t expect to succeed and probably sees herself as a failure. The Empress would have led her to wonderful achievements and empowered her with confidence and self-esteem if the subconscious urges of the Reversed Three of Pentacles had not constantly interfered. 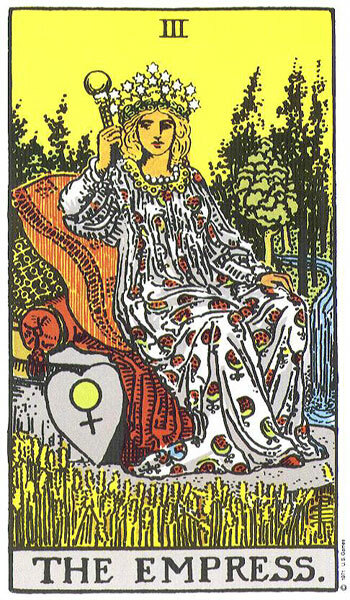 However, The Empress by her status and position, far outranks the lowly aspect of the Reversed Three of Pentacles, a Minor Arcana Card, but the subconscious is powerful. On the upper level we have the power of three in an upright ascent. On the lower level, the power of three in a reversed descent. It is interfering with growth and progress. She never gets anywhere or completes the projects she begins. 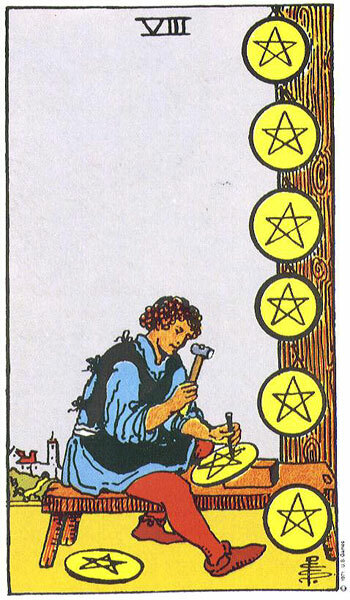 It is insidious in the manner it uses the Reversed Three of Pentacles to self-sabotage. In an ideal world it is The Empress Cora would choose to align herself with, not the Reversed Three of Pentacles. However, I don’t think she has been fully aware what’s been going on, and why The Empress always felt so far out of reach. She was being controlled from within and on automatic pilot. In this card we see a powerful and traumatic end to a cycle in Cora’s life. Her cancer knocked her to the ground and took away the life she had and all she was familiar with. It destroyed her health and weakened her. Here sits Cora’s depression and feelings of hopelessness. She tried to hold on and keep this life together by struggling to go back to work when she really did not feel well enough. Eventually she had to let go and say goodbye, and allow the death of that cycle to take place. 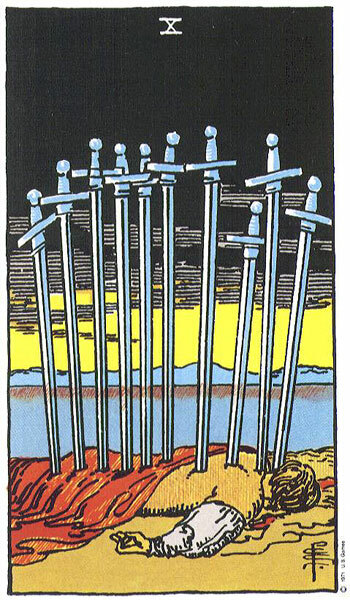 The aftermath of The Ten of Swords can be very difficult, and Cora has told us all about it. She had fallen quite deeply into the dark hole of despair and was still sitting there on the day her daughter came looking for something out of the attic. It was upon finding her old work, her buried talent, that Cora looked up and saw the dawn breaking on the horizon in the Ten of Swords and we can see what occurred. 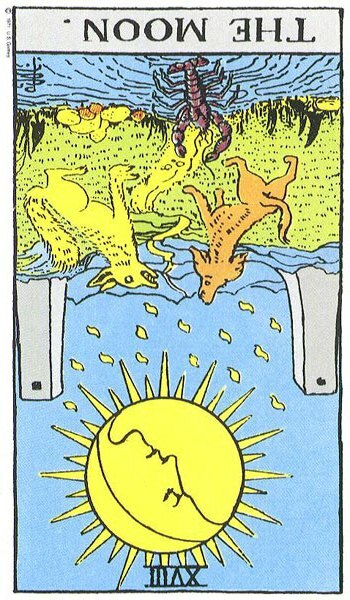 The Four of Cups that sat wallowing in the dark hole woke up and wanted to get out. This is the breakthrough moment that ended her lingering depression. Within a short space of time she was back singing at her piano which awoke the creative flow and released the block. Cora needs to exert some mental discipline now if she really means to move her situation forward. She claims she is running around in circles and hasn’t a clue what to do. 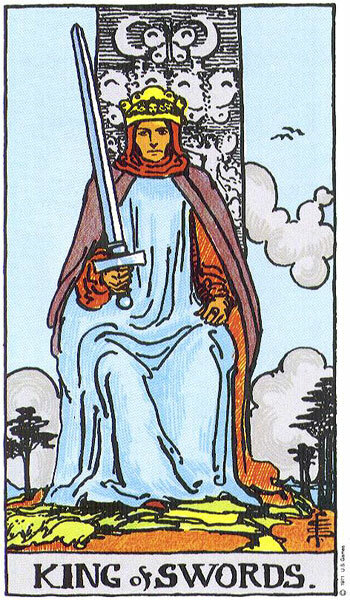 The King of Swords asks her to calm down and think rationally. She needs to get some clarity on her situation so that she can decide what her real options are. She needs a strategy, some structured plan of action to work with. She cannot run around entertaining all sorts of grand ideas unless she has some way of manifesting them. She has to give a lot of thought now as to what she wants to do, and make her decisions based on solid research I think Cora could take a leaf from The King of Swords book by getting a firm hand on her turbulent emotions demonstrated in The Reversed Moon, and ridding herself of lingering doubts and negative mind-sets. She might benefit from seeking some expert advice and this might entail finding a mentor, or taking the bold move in showing her work to those in the profession who can offer constructive advice. She needs to toughen up a little. I also feel that this Card reflects her severe inner critic and is linked to her Reversed Three of Pentacles and Reversed Moon. I ask her if she had struggled to assert herself in the past and what sort of relationship she had with her father? Was he supportive of her work and career choice? Cora tells me that her father had been very strict and rarely passed compliments. He attended every performance or recital she was involved in, but only ever commented on what she got wrong, and not what went well. If she missed a note or hesitated on a line, he would chastise her about her clumsiness. He was intent on her pursuing music from a classical point of view while Cora was interested in stage musicals. Her father sneeringly told her she might as well join the circus. Her mother was a quiet passive woman who rarely stood up for her, even though in private she would tell her not to mind her father for it was just his way. He struggled with his emotions. The only emotion Cora could remember from him was controlled anger and cynicism. This told a story in itself and explained the unfinished work in the attic that no one had ever seen. Her father’s influence had far-reaching tentacles. It had followed her from her past, into her present and would affect her future too, if she did not address her fears. I asked about the singing teaching job she had held for so many years. Had she felt her talents had been properly recognised? Cora told me that she was actually trained to teach music at degree level but the job she held was at a much lower level. She had not advanced in all those years choosing to stay in a certain comfort zone where people didn’t have terribly high expectations of her abilities. This was sad to hear and again resonated with her father’s dismissive and critical attitude of her talent. Cora stayed clear of attracting unnecessary criticism by working in a position that was below her level of qualification and ability. She didn’t believe she was good enough to secure a higher position so had chosen mediocrity instead. Although she had been content, she had not realised her potential. She saw her father’s disapproving look on everyone’s face and aimed not to draw attention to herself. She must choose to use the energy of The King of Swords in a more positive manner now, and realise that not every King of Swords she comes across will be the same as her father. She needs to deal with these limiting mindsets. In the future she will be dealing with The King of Swords and his type, so she must steel herself to become more assertive in their presence. This King of Swords will be here to help, but he won’t handle her with kid gloves. What he says or advises, will be in Cora’s best interest, and not to destroy her confidence. In fact he symbolically stands for the World of Critics who do just that, critique other people’s work. Cora will not be able to avoid the opinions of others should she decide to release her work to the World. She will have to get used to handling criticism. The Ten of Swords has cleared the field and is giving her the opportunity of a fresh start with a whole new mindset. She must now use The King of Swords for empowerment instead of destruction. She will not be able to complete her work and earn a living from it until she starts believing in it and herself. Her father is no longer here to criticise it, or her. She is afraid of how her work will be received and the feedback she will get. She must learn the difference between constructive feedback and humiliation. The Journey Cora embarked upon in The Ace of Pentacles many years ago must be completed. She has to climb aboard and commit to the journey ahead with determination and self-belief. She must crush her fears and bring any conflicting emotions under control. 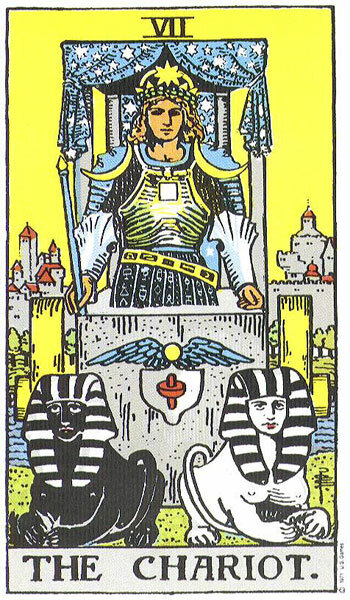 The Chariot follows on from The King of Swords in a supporting manner. Time to strike out on her own and hold firm. There can be no more indecisiveness and running from one thing to another. Cora has to steer her Chariot in one direction now and that direction needs to lead her to The Empress where she will be in a position to achieve her goals and ambitions. She has let her horses run in too many conflicting directions by undertaking courses and the endless search for jobs when she has all she needs at her disposal. She has downplayed her own talents and abilities, and dissipated her energies on unfulfilling pursuits. She needs to take up the reins now for she has the power within her own hands to steer towards a better future. Tenacity and mental discipline are key right now. Cora will need to focus on her work and drive it forward by staying focused and in control. She must let nothing stand in her way. Victory is hers for the taking if she can achieve this. This is a very positive card and tells me that there is a market for Cora’s work where she has the potential for real success. Because this is The World Card I sense the presence of a global audience and therefore would applaud her daughter’s idea for putting her work online. I think she will be astounded by the response, and the time is right for her to make this move. Maybe her daughter can help with all the technical side of things. The World ties in nicely with The Empress and I feel this card offers Cora incredible support by its presence. She will achieve the acclaim she never got from her father, but also I can see her grow in herself and become more Empress-like in her personality. She can take her rightful place in the world and has nothing to fear from The World in this position, as she will have earned her success. The World also speaks of the sense of achievement and personal success on the completion of a project. It has been a long road with many ups and downs along the way but there is an air of celebration on completion now. The World imagery conjures up visuals of stage productions, dancing, acting and singing. There is a place for Cora in this world. I do feel Cora should begin moving in the right circles at this stage. She needs to be around people who understand what she is doing. She needs to re-enter the world of music, but it must be in the area she is interested in. The World suggests, stage, music, dance. Therefore music and drama societies would be great places for her to network and get inspiration. She could join a group or even offer some free coaching for local productions just to get her foot in the door again. Cora probably needs to up-skill a bit and explore what is happening in the world of stage music. There are new trends, new technology and new methods. To be part of the current global music movement she will have to catch up with the way things are done and the expectations of her audience. Any courses that bring her into this realm will be well worth it as they will facilitate her ultimate aims. They will help take her where she wants to go. Now here I am getting a mixed reaction. This card ties in with the Reversed Three of Pentacles in Position 4 where I believed there was a subconscious conditioning towards undervaluing her work. 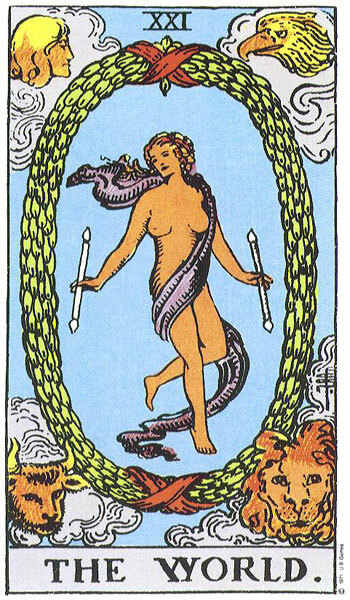 She perceives herself to be not good enough in the Reversed Three, the Poor Apprentice who cannot make the grade, yet here we now see her looking hopefully towards The Eight of Pentacles, mastering the skills and being proud of her work. In The Eight she is hoping to believe that she is suitably qualified and talented enough to follow through on her ambitions. Has The King of Swords talked some sense into her? He is sitting pretty close to The Eight of Pentacles in the Spread. Will she now be convinced of her worth and ability? The Eight of Pentacles ties in with The Chariot in that it speaks of commitment and endurance in order to triumph. Cora wants her work to be outstanding and has high standards. Her father pushed her and forced incredibly high standards on Cora which she believes she never lived up to. In a way, Cora can thank her father for stretching her so far. She has more ability than she realises and has always been working at 150%. With such meticulous attention and application Cora can stand out from the crowd if she wants to. What she hopes to do now is be left alone to fully concentrate on her work and not get pulled in so many directions. She needs money too and desperately hopes to earn an income from all her hard work. She is concerned about wasting any more time on senseless or useless endeavors. She wants to be sure that this is it now. 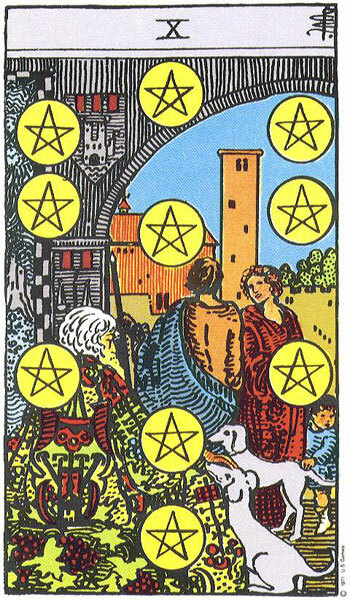 Can The Eight of Pentacles triumph over The Reversed Three of Pentacles? I do hope so and think it possible. However, my concern is that with Cora’s history of lack of self-belief and trust in her own work, The Empress may stay pregnant indefinitely. With Cora constantly revisiting her work and picking at it day after day in The Eight of Pentacles, will she ever think that it is done and give birth to it? Cora, could sit on her work for years and claim that it is not yet ready, not good enough to release. She will also need to understand the sense of its monetary worth. Will Cora feel comfortable about asking for payment? I ask her about this and she says it is something she will struggle with. She tells me that she used to take students on a private basis but found the money part extremely stressful. Her hour-long lessons ran into two and she let students leave without paying. She never felt brave enough to ask them when they turned up the next week. In the end she stopped taking private students. She found her job as a music teacher in an organised school much less demanding. She got her salary every month without question. I point out to Cora that this is where she will need to enforce the energy of The King of Swords and The Chariot otherwise she will be an extremely busy, but very poor woman. She has to learn to put a price on her time. Yet again, she was subconsciously driven to believe her work not good enough to expect payment for. Cora, is worried about her finances and has tried unsuccessfully to get a job. She spent a lot of time taking courses and getting qualifications for jobs or careers that were not music related. The need for money was her driving force and the belief that she wasn’t good enough to use her natural talents and music qualifications to secure employment. She is now beginning to think otherwise, but is still very unsure of herself. On a worst case scenario, Cora could always try out private tuition again, but in a more business-like manner. She certainly has the natural resources to earn a living. She needs to get down to some real work now instead of wishing, thinking and talking about it. Well this is certainly a very welcome card indeed and holds much promise for Cora should she decide to drive her Chariot forward. Here we find financial abundance on a much larger scale than we would dare hope for. The rewards are there for her, there is a pot of gold at the end of the rainbow with Cora’s name on it, but a lot of work has to be done on many levels before she can enjoy her rewards. This supports The World Card and The Eight of Pentacles as it speaks of success and reward for hard work done. There is certainly money to be made out of Cora’s idea if she can manage it appropriately. The potential is certainly there. What is wonderful is how nicely this card lines up with The Empress. We have a double sense of abundance. Cora can both creatively and financially thrive at the same time. She could get everything she has been looking for. Her music will be her legacy. She has the potential to earn a living doing something she really loves. What better outcome could there be? These two cards might suggest the Sun Sign of Cancer. The Queen of Cups is missing though. I ask Cora which sign she is and she tells me Sagittarius. She is a Fire Sign but one would never think it. Possibly the Fire inside her was destroyed or extinguished over the years. She is displaying and living the life of a dysfunctional Reversed Cancer Personality in that she is riddled with insecurities, anxiety, is nervous and lacking in assertiveness. The Queen of Cups’ absence may suggest that Cora has adopted this personality rather than fully owning it. At the end of the day it is not really her. Her worries, concerns and poor self-image have made her passive. One of the Karmic Lessons for Cancer is the need to find emotional strength; to face fears and overcome them, to not run and shelter in their shell when the going gets tough. I am not an Astrologist and Cora has never had her Birth Chart done. She doesn’t know if Cancer features strongly in any of her houses. She is only aware of the disease, cancer she has battled. I believe it is personality traits and not connected to her disease, but it may be symbolically representing it. However, she is a Fire Sign and needs to relight that spark in her personality as soon as possible. Not one Wand Card in her reading! Sagittarius is also the Sign of The Passionate Teacher. Cora had a passion, still has, but it has been suppressed. I believe Cora would be an excellent Music Teacher. Cora is not being true to herself and lost her personality somewhere along the way. She needs to find it again so that she does not retreat back into the Four of Cups’ state of apathy and lethargy. She needs to find the Queen of Wands now and bring her out of retirement. Here we have multi-layered aspects coming into play and The Emperor reminds me of the dual aspect I observed in The King of Swords. Both are quite similar in stature and equally as formidable, and possibly stern looking. As with The King of Swords, Cora needs to work with both the memories of the negative aspect of The Emperor, the stern and critical father-figure who negatively influenced her upbringing, and that of the strong, focused, self-governed personality who takes charge of his life in order to reach his goals. Death comes in to sweepingly cut the ties that bind so that she can let go of the negative aspect of The Emperor she has carried with her for so long. He no longer has control over her. Death tells her that the cycle is over and she must adapt now to being free to determine her own life in whatever she decides to do. She has been haunted by the past for too long and held on to limiting mindsets that kept her powerless and restricted. Death acknowledges that the transition will not be easy for her, but is essential. She now has to embrace the change and not look back. Indeed she has to accept that the past is actually gone. 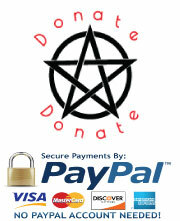 Death took everything away from her when she became ill, had to leave her job, and lost financial stability. Cora would have let her life drift on as it was. She may have been content, but she would never have grown. Death may have done her a great service if she can grasp the positive aspect of The Emperor to drive her Chariot forward. It is The Emperor who will eagerly jump on board The Chariot and provide her with the will-power, self-discipline and self-control to focus on her goal or destination. He will encourage her to be fearless and brave, but she must believe in herself first if she is to expect anyone else to take her seriously. It is time for Cora to get her house in order and carve out a new life that is not governed by fear or uncertainty. The Emperor also wants her to toughen up and asks her not to judge all Emperors based on her past experiences. He is here to protect and defend her and only wants to help. She has nothing to fear anymore and must assert control over her emotions and imagination as they have been doing her a great disservice. 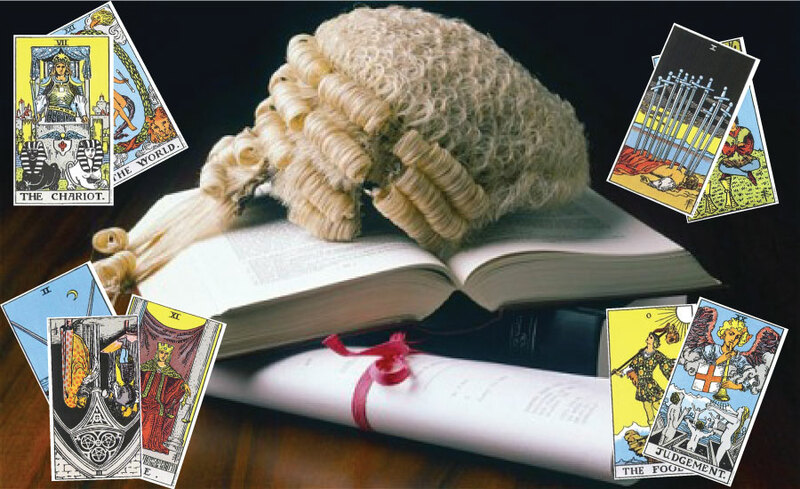 All in all this is a very powerful reading and extremely positive. Certain Cards stand out. In The Empress she has the desire, creativity, and natural talent. In The King of Swords she can secure mental discipline. In The Chariot and Emperor she can become driven and focused on her goal. In The Eight of Pentacles she can acknowledge her talent, qualifications and standards, and charge accordingly. 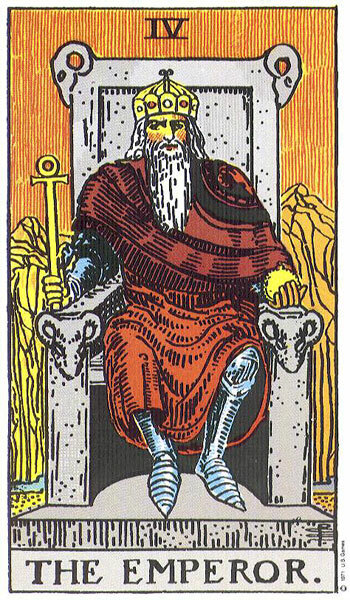 The Chariot and Eight of Pentacles are powerful motivators but demand commitment and sustained effort. 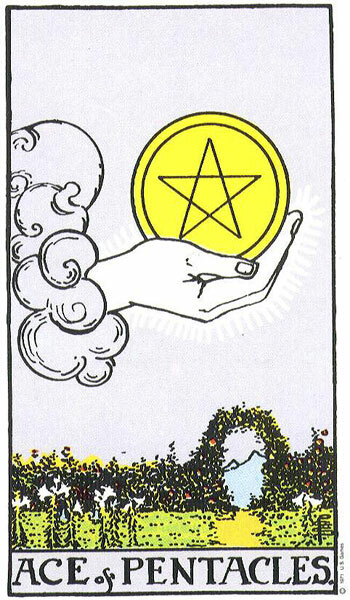 The World and Ten of Pentacles suggest great success on many levels. Death brings the much-needed end of a cycle, transformation, and the severance of negative ties with the harsh aspects of both The King of Swords and The Emperor. With The Empress as her Ideal Outcome and The Ten of Pentacles as her Outcome, these Cards align beautifully to suggest the potential to achieve her goals which could easily exceed her expectations. Taking a look at The Empress and World Card together we feel the overwhelming power of success on a creative level. It is all there for the taking. 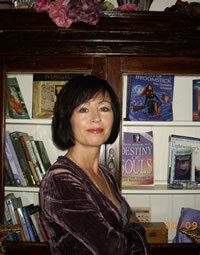 Her reading certainly shifts away from the darkness and trauma of the past and becomes lively and uplifting. However, that is how we see it, but from where Cora stands, within her own heart and head, she feels and thinks things we don’t. We cannot expect her to pull herself together, just because we tell her. We can point it out to her, that is all. She must take charge of it herself. 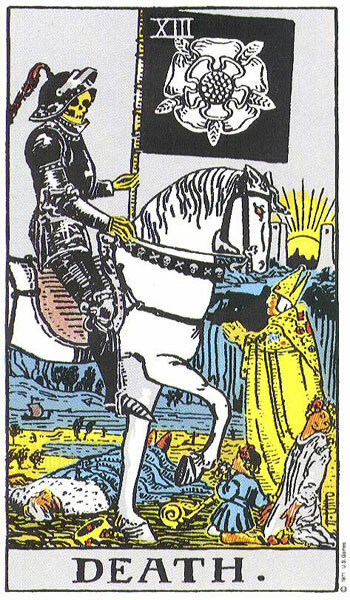 We cannot ride or steer her Chariot for her, nor can we meet with The King of Swords on her behalf. What Challenges her and What Subconsciously Influences her will need to be overcome. The potential for success is really there. The Wands Suit does not make an appearance in this Reading and that would worry me a bit. She is a Fire Sign, but there is no Fire. Their absence suggests a lack of energy, excitement and enthusiasm. They also hint at a lack of get up and go. The Wands would bring in positivity and optimism. Cora is still not convinced about her project and will be hesitant at taking the risk to run with it. She is wary about becoming an Entrepreneur and may be fearful of sharing her daughter’s vision. This is very un-fire like. She is also tired in herself, so her fires are bound to be burning low. Her reading shows great potential but it will amount to nothing unless Cora actually acts upon it. There is also a lack of Cups (except for the Reversed Four) in Cora’s Reading which is quite sad. The Empress in her could do with some company and I feel she could do with working on developing a social life for herself. Without Cups and Wands there will be little fun and play. The Empress cannot thrive in that manner. Should she join up with some societies in relation to her work, e.g. help with the staging of a musical in her local community, she will discover the great social aspect that revolves around these groups. She might enjoy being a part of that world. She can also network and may get some private students who will be happy to pay.